Designers can maximize the passenger experience by adding lightweight materials not only in the seat structure, but at the “touch points” where they interact with the seat itself. Industry-leading aircraft designs utilize lightweight composites and engineered alloys that not only reduce weight, but optimize aircraft speed and fuel consumption. With “lightweighting” at the forefront of aircraft design, Aerospace OEMs continue to examine every aspect of the aircraft, from engine to body, as well as interior applications to determine additional areas where weight can be reduced. Nowhere is this more prevalent than in aircraft seating design. With the cost of fuel on the rise and flights becoming increasingly overcrowded, major aircraft carriers are challenging Aerospace interior suppliers to increase seating numbers within the air cabin, without adding unnecessary weight. However, incorporating more seating into the cabin requires a calculated design approach that maximizes space, without sacrificing passenger safety, comfort or seat functionality. Design engineers can enhance the passenger experience and maximize functionality of seating applications by incorporating lightweight seating functionality into the areas of the seat that the passenger interacts with, such as headrests, food trays and inflight entertainment (IFE) systems. Focusing on these smaller “touch points” can create a larger impact by improving inflight usability and perception of airline quality. 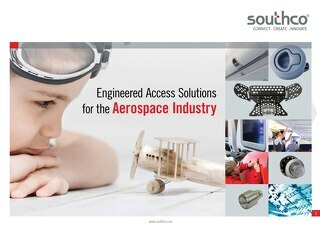 Common materials used in new aircraft design today include engineered alloys and composites such as aluminum and thermoplastics that are lightweight, but still provide durability and strength across many different Aerospace applications. This includes not only seating, but structural and exterior areas, access panels, infotainment and inflight food service carts and cabinets as well. 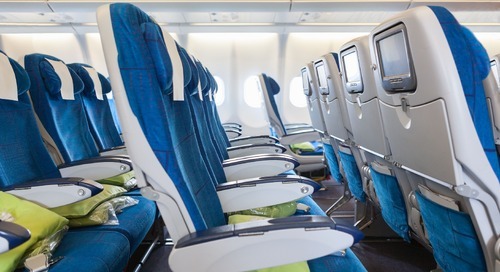 With the surplus of lightweight composite materials and alloys available, as well as new advances in technology such as smaller, more portable electronics, Aerospace interior integrators are giving traditional seating designs a major facelift. For aircraft seating designers however, reducing weight while preserving a quality experience for the passenger is often a delicate balance. While many OEMs are concentrating their efforts on stripping the weight from seating designs, using lightweight materials in certain functional aspects of the seat could potentially have a negative impact on the passenger experience. For passengers, their perception of how a seat feels during flight could also affect how they perceive the quality of materials used in the overall design of the aircraft. For example, if a food tray falls down into a passenger’s lap during takeoff, the seat squeaks and rattles, or if any feature is perceived as insubstantial, they may begin to extend that perception and wonder about the structural integrity of the aircraft itself. To ensure that quality and end user comfort is not sacrificed when replacing traditional materials with lightweight options, design engineers are taking a closer look at new technologies that can be used to improve passenger touch points in seating design. 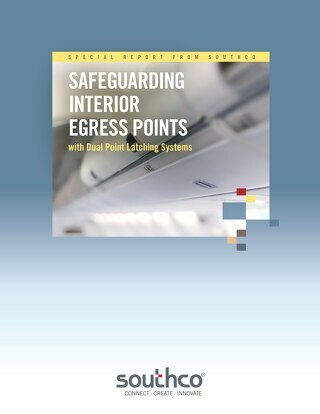 Incorporating lightweight access control mechanisms into aircraft seating applications ensures functionality and provides the comfort and ergonomic advantages that end users desire. 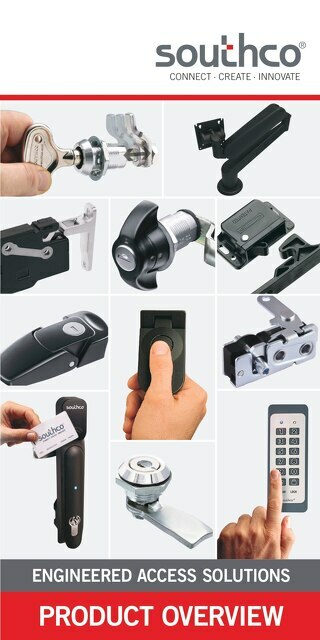 Position control hinges for instance, using friction technology, simplify user operation and provide reliable, consistent positioning of food trays, headrests and display monitors. 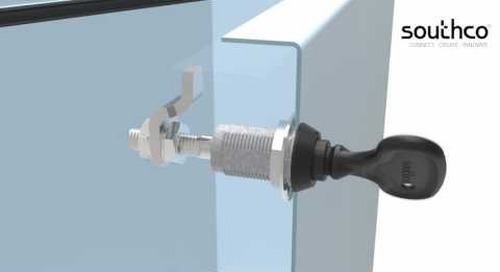 Position control hinges designed with engineered friction technology provide continuous resistance against motion, making a lightweight plastic table or tray feel heavier and more substantial for the end user. 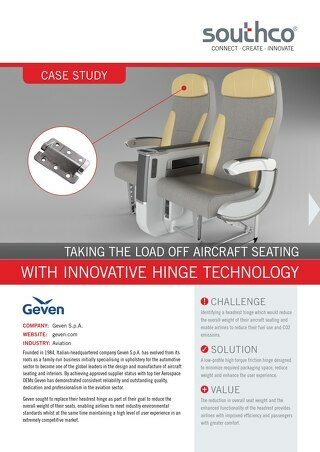 Adding torque hinging solutions into seating applications not only helps to control motion and vibration, it also creates a quality experience for the passenger, whether seated in economy or first class. 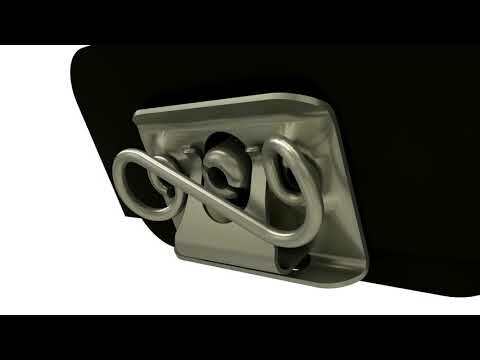 Southco’s ST Constant Torque Hinges provide constant resistance throughout the entire range of motion, enabling users to easily position food trays, display screens and other mounted seating components and hold them securely at any desired angle. Constant torque hinges provide resistance throughout the entire range of motion, allowing the user to easily adjust the angle of a tray or table or keep it from falling down once it has been restored to its original upright position. This type of positioning technology also provides the advantage in that the design can be dialed in to withstand a maximum amount of force required to stay in position, even if a passenger rests their full weight upon the tray. 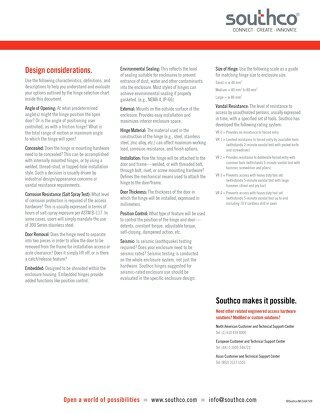 Another area where positioning technology can be used to provide a quality end user experience is in headrest design. With current designs, vertical adjustment has previously been achieved with limited success, resulting in inconsistent cycle life and increased maintenance costs. Outdated vertical friction affects the reliability and functionality of headrests over time, resulting in a design that cannot maintain position and thus no longer supports a passenger’s head. 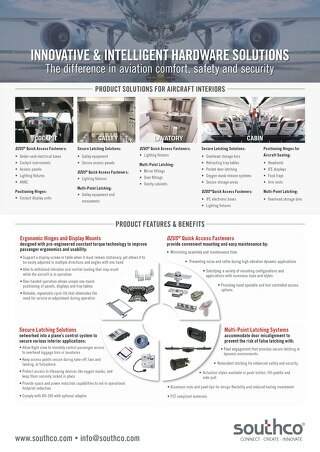 Headrest solutions that contain integrated positioning technology in the wing design provide reliable and flexible constant torque capabilities that can be seamlessly integrated into OEM seating designs. Asymmetric torque allows the design engineer to specify various operating efforts in different directions of motion, allowing end users to easily pull the wings forward for adjustment, yet still be supported when resting their full weight against it. Lightweight headrest solutions can be integrated into reduced weight seat designs and mounts to the back of a seat body or existing structure. Rather than bolting on additional hardware, incorporating both vertical slide and wing tilt elements directly into the headrest solution can save valuable design space. These integrated solutions result in additional weight savings that can be achieved over traditional headrest designs. 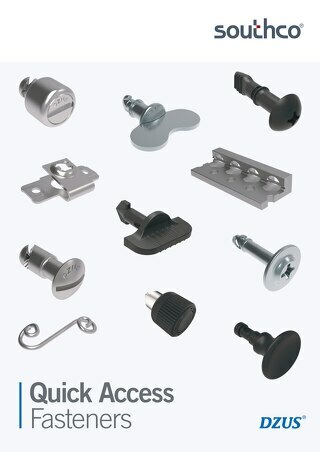 Torque hinges are also being used in new IFE systems designed to accommodate personal electronic devices. 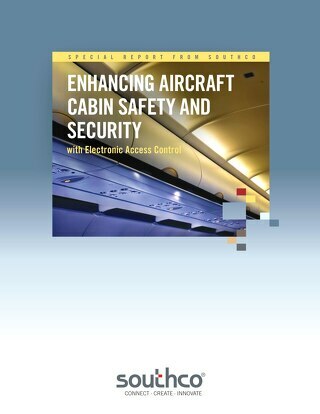 With the Federal Aviation Administration (FAA) recently lifting its ban on the use of most electronic devices during takeoff and landing, and the rise of gate-to-gate connectivity allowing passengers to connect to inflight networks once they board the aircraft, carriers are exploring new ways to make tablet use more ergonomic. Aerospace OEMs are designing cutting-edge IFE mounts into arm rests or on the back of seating, which can be easily folded out and stowed when not in use.  In these applications, constant torque hinges simplify the adjustment and positioning of a passenger’s tablet or smartphone once the device has been docked, and prevents drift caused by fingertip use or vibration during flight. Although trends are moving away from traditional IFE in seat backs, position control hinges can also be used to support existing, traditional inflight entertainment systems, such as screens and monitors mounted in the back of the passenger seat. However, as more passengers carry on their personal electronic devices and carriers begin offering inflight tablet rental as an option, there may come a time when traditional seat-mounted IFE systems are no longer needed. Seating designed without traditional IFE systems has the potential to contribute significantly in the reduction of overall seat weight. This means the OEM can better optimize the structure or framing of the seat design, resulting in overall weight reduction, and still pass FAA impact requirements without using exotic and excessively priced materials. Moving into the future, it is crucial for Aerospace OEMs to anticipate changing design trends presented by lightweighting and adjust their designs to suit these requirements. According to a fuel cost study performed by the FAA, oil prices are projected to rise to over $115 USD per barrel by 2020, with a gradual increase to over $118 USD per barrel by 2025, making it more important than ever for design engineers to reduce weight wherever possible. When choosing lightweight materials for next generation seating designs, even the smallest touch point can make all the difference to the passenger experience. 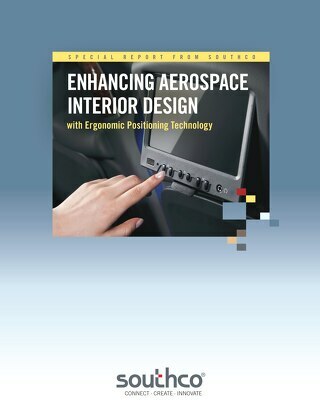 By integrating lightweight access hardware and positioning technology into aircraft interior applications such as seating, OEMs and interior integrators can improve usability, safety and reliability for the end user for years to come. 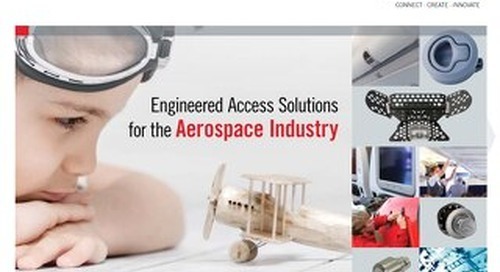 Versatile, proven positioning technology designed to meet the needs of the Aerospace industry provides engineers with standardized solutions for conserving weight across seating applications, ultimately contributing to the overall reduction of operation and fuel costs in large scale aircraft design.